You can gain real-world museum experience through internships, assistantships, special projects, and field trips. Mon.-Sat. 10 a.m. – 4 p.m. and Sun. 1 – 5 p.m.
An important Civil War site, Sandusky sits just a mile and a half from LC. It is a registered Virginia Historic Landmark and listed on the National Register of Historic Places. The house is one of the finest examples of Federal style architecture in Virginia’s Piedmont region and is on the Civil War Trails tour. Sandusky’s library, document archives, and collections provide a variety of options for student research, scholarship, and publication. Four MA in History students participated in a six-week archaeology field school held this summer to excavate, analyze, and interpret the remains of a nineteenth century kitchen at Sandusky plantation. These kitchen remains will provide insight into the food practices and daily lives of both enslaved African Americans and the families who owned Sandusky. “My two favorite things are digging and working in the lab, processing the artifacts,” said Victoria Lunsford, one of the LC history graduate students working at the site. 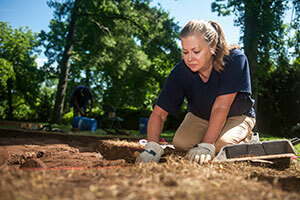 She and fellow student Marshall Dunn made the biggest find, a brick feature — perhaps a path, in the second week of excavation. “It’s by far the coolest thing,” said Victoria, who grew up in the house next door and played at Sandusky as a child. The other two students, Betty Goad Stinson ’95 and Joe Olsen ’12, were excited to participate in fines including Civil War relics such as minie balls and a watch fob, a harmonica plate, a pin case, buttons, and destruction debris from when the kitchen was torn down sometime after 1937. Some of the items date to the late 1700s and early 1800s. “We’re touching history again for the first time since it was dropped 150 years ago,” said Greg Starbuck, executive director at Historic Sandusky and also an LC graduate student. Two internships provide MA in History students with opportunities to work closely with Director Starbuck on organizing the museum’s collections, researching details of the home and its occupants, as well as interacting with the public. Historic Sandusky is a Federal-style Virginia home built circa 1808 with a a rich history that intersects repeatedly with the story of America. The builder and first owner, Charles Johnston, survived an Indian massacre and captivity in the Ohio Territory near a settlement called Sandusky. When he settled in Virginia, he established the house as the centerpiece of his 1,200 acre plantation and named it Sandusky in recognition of his escape. He later wrote a memoir about his experiences with the help of James Madison. Many notable Americans were guests at Sandusky including Thomas Jefferson, Rutherford B. Hayes, and William McKinley. During the Civil War, Sandusky was seized by Union General David Hunter and used as a military headquarters during the June 1864 Battle of Lynchburg in which Confederate General Jubal Early drove out the Union soldiers, saving the Hill City from major destruction. Sandusky’s barn was used as a field hospital and its roof as a signal station. The Sandusky house was privately owned until 2001 when a citizen’s group purchased it for public use. Since then, restoration has begun, a visitor center and museum built, and a library and archives established. In June 2012, Historic Sandusky won three regional Emmy® awards for its documentary film, “Hunter’s Raid: The Battle for Lynchburg,” which included performances by several LC faculty, staff, and students. The film won for Best Documentary, Best Director, and Best Editing. Written and directed by Historic Sandusky Executive Director Greg Starbuck, the 55-minute documentary describes the tense days in June 1864 when Hunter and his army occupied the house. “The awards are an honor and a testament to the community support Historic Sandusky received in making this film,” Starbuck said. “We could not have made such a quality film without the intensive involvement by hundreds of local citizens. It was also memorable that we premiered the film at University of Lynchburg and that numerous LC faculty, staff, and students appeared in the production,” said Starbuck.